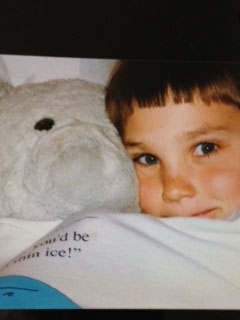 Michael is a large white turned grey stuffed bear that Bear got when he was 2 years old and adored. I know Bree-paws I have thoroughly sniffed him out to see what the big deal was from the tails I’ve heard. Until, The Incident That No one Can Ever Forget. The Forever Family took a trip to Chicago for a V&V with friends and family. Somehow, while traveling on one of those Transport Buses that take you from the bearport to the rental car, Michael was left behind on the Bus. OH NO! 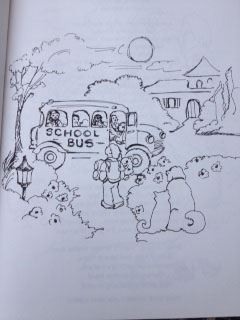 As soon as they realized it, MM started chasing the now departing Bus down the street yelling STOP! STOP! Her shoes even came flying off but she still kept running. Bus didn’t stop and soon became lost in the crush of vehicles. MM and DD did everything hoomanly possible to track down the Bus who jacked Michael, while their pup howled and screamed and cried, “Michael! Michael!” It went on for hours, even after they gave up the search at the airport and moved on to the friend’s house. All night poor Bear howled and cried and nobody got much sleep that night! The next day, MM and DD went to a Chicago department store to find a replacement Michael, and finally found one that looked almost exactly the same. They even put some dirt on Michael #2 and hoped Bear wouldn’t know the difference. Because Michael #1 was on a bus somewhere going in circles around the airport, or hopefully some hooman child adopted him. But Bear knew immediately MM and DD were trying to pass off an imposter. “NOT MICHAEL!” More howling from a kid you would think had no voice or tears left. Eventually Michael #2 was accepted and loved just as much. MM and DD considered having him under 24 hour surveillance. The new best buds maintained a friendship of many years. In fact, he was loved so much he started to develop rips and holes and tears so MM was constantly fixing him with needle and thread, while Bear watched each surgery closely. Soon there were almost no more places to sew, so his head was kind of floppy. Threads everywhere! Bear also closely monitored Michaels bath time in the washing machine. He would come out smelling of lovely laundry soaps, which would last a day or 2 and then he smelled like Bear/boy again! MM said Bear would give up Michael when he was ready. But MM was right. She never tried to separate Bear and Michael#2, things just took a natural course. Bear would go off to play baseball while Michael stayed home instead of cheering from the stands. He would go to his pup friend’s houses to play while Michael watched over his stuff. And now that Bear has a girlfriend and a college degree and a career, Michael is happy to watch over it all and is quite pup-content to enjoy his old age in relative peace on the couch. He sits, smiling to himself, head drooping, with his amazing memories of adventures with his best bud to keep him warm. And he still guards all the secrets! I know, be-paws I tried to get him to tell me, and he Bree-mains silent. He is the Silent Witness to the Beary best love and friendship! Bree-quest: give your best bud a bear hug today! As always, Bree-loha! Love it and yes, it did make me laugh. Haven’t we all gone through the sleepless night when the favorite bear/blanket was left behind? Is yours woofer or hooman? toy/blanket? I wonder if yours found Michael #1 somewhere? Love the addition of music. The song is lovely! Had to play it twice while I read Michael’s story. Sweet! Musicama wrote that song when Bear was in kindergarten! Michael was too young to be in that class. He had to go to pre-school first! So now you can sing harmony on the chorus with my music mama! and I appreciate your innovative story. Sometimes another language is hard to understand. I nose, be-paws I speak Bree! But I hope Musicmama’s song is universal. Music can unite all people in the world. As a dog lover named Michael I only wish we were closer, in Texas actually, to meet Michael. at the airport in Texas where you live. Is that near Hawaii be-paws my FF keeps talking about wanting to go there on a plane. Thank you for inviting us to meet you! I hope you have lots of tasty treats in Texas! ” There was a little girl in class who loved her Teddy too. It made her very happy, until she kept asking to hear it again. Sorry you had to hear it again and again and again. I did too. When is Music Mama going to write a song about ME! I am cuter than Michael. I heard your beautiful song. It reminded me of Toy Story 3 where Andy grows up and leaves Woody for college. Looking forward to our talk tomorrow. Thank you. I will have to ask Musicmama if she will let me watch that “Toy Story” movie. She says you have a grr-eat blog to help people blog. Loved this. The Blogger Pit Stop brought me over and I have to say I still have a tiny bit of blankie left that I treasure for the memories. Kid you not. It is only a tiny piece but so full of those sleepless moments when blankie was missing. Do you have a new one now? love my blog. I will tell Michael too. Thank you for visiting us. Awww! What a sweet song! Makes me nostalgic for when my babies were small. I wonder what happens to those babies when the teenagers suddenly appear? I guess you can visit them in pictures, but my mama says she wants her baby pups back! Thank you for having me join your Pit Stop Crew! What would my job be? I can bark at anything or anyone you don’t want! And more thank you fur your comment on the MICHAEL song. So happy you liked it! I will tell Michael when he gets up from his nap! We hope to have more nice hoomans like you, come and enjoy my spy stories.